It’s Sunday and we’ve got a fresh and delicious menu plan, with a printable grocery list…all for free! I know it’s Valentine’s Day, and you might be busy, so this should free up some time today to spend with the one you love…or to treat yo’self. Even though I’m married, we really don’t do Valentine’s day. So I’m going to go out and pamper myself with a pedicure. Right after I grab the groceries for this week. This week I’ve included some great recipes that are quick to cook…zucchini turkey burgers, scrumptious shrimp linguini, a fresh and my favorite snack, cherry almond energy balls…plus lots more. It’s all healthful and family friendly. It’s healthy menu planning made simple. 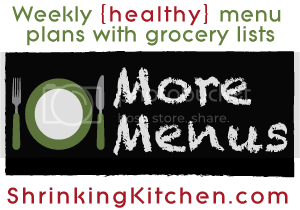 I hope you enjoy this week’s menu, and don’t forget to stop by every Sunday for a brand new menu plan! Tuesday: Slow Cooker Gluten Free Minestrone with crusty whole grain bread. Wednesday: Creamy Cajun Shrimp Linguini with steamed green beans. Thursday: Loaded Vegetable Frittata with fresh melon. Friday: Go out for dinner, have some leftovers, grab some takeout!